The Norwich Evening News highlights how Historic England (HE) has warned it will fight to see a Norwich City Council development at Anglia Square called in by the Secretary of State if approval looks likely. … Historic England has said if Norwich City Council recommends the Anglia Square development for approval it will seek to see it called in by the secretary of state – a process where the government takes on the decision, rather than the local authority. The revamp of Anglia Square would see 1,200 new homes built, along with a new leisure quarter, 200-bed hotel, car park, replacement cinema and 25-storey tower block. 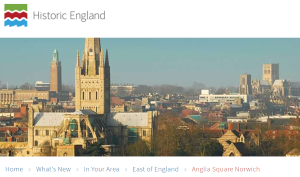 It has proved divisive – while some, including the New Anglia LEP, have welcomed a new chapter for the area, others, including civic watchdog the Norwich Society, have criticised the plans and, in particular, the tower.